The Holy Father’s Sunday meditation before praying the Angelus this morning was dedicated to Jesus’ visit to the house of Martha and Mary in Bethany in the Gospel of St. Luke, and the two key themes of Christian life: contemplation, listening to the Word of God and the concrete service of our neighbor. These are not to be experienced separately, but rather are two aspects to be lived “in profound unity and harmony”. The Bishop of Rome explained to the thousands of the faithful gathered in St. Peter’s Square that the two sisters “both welcome the Lord, but in different ways. 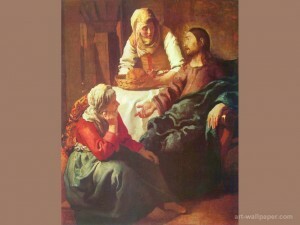 Mary sits at Jesus’ feet, listening, whereas Martha is absorbed in domestic tasks and is so busy that she turns to Jesus saying: ‘Lord, do you not care that my sister has left me by myself to do the serving? Tell her to help me’. And Jesus responds rebuking her with sweetness. ‘Martha, Martha, you are anxious and worried about many things. There is the need for only one thing’”. “What does Jesus wish to say?” continued the Pope. “Above all it is important to understand that it is not a matter of two contrasting attitudes: listening to the Word of the Lord – contemplation – and concrete service to our neighbor. They are not two opposed attitudes but, on the contrary, they are both aspects that are essential for our Christian life; aspects that must never be separated but rather lived in profound unity and harmony”. “So why does Jesus rebuke Martha? Because she considered only what she was doing to be essential; she was too absorbed and worried about things to ‘do’. For a Christian, the works of service and charity are never detached from the principle source of our action: that is, listening to the Word of the Lord, sitting – like Mary – at Jesus’ feet in the attitude of a disciple. And for this reason Mary is rebuked”. Pope Francis affirmed that “in our Christian life too prayer and action are always profoundly united. Prayer that does not lead to concrete action toward a brother who is poor, sick, in need of help … is a sterile and incomplete prayer. But, in the same way, when in ecclesial service we are only concerned with what we are doing, we give greater weight to things, functions and structures, forgetting the centrality of Christ; we do not set aside time for dialogue with Him in prayer, we run the risk of serving ourselves and not God, present in our brother in need”. “Let us ask the Virgin Mary, Mother of listening and service, who teaches us to meditate on the Word of her Son in our heart, to pray with fidelity, and to be ever more concretely attentive to the needs of our brothers”.